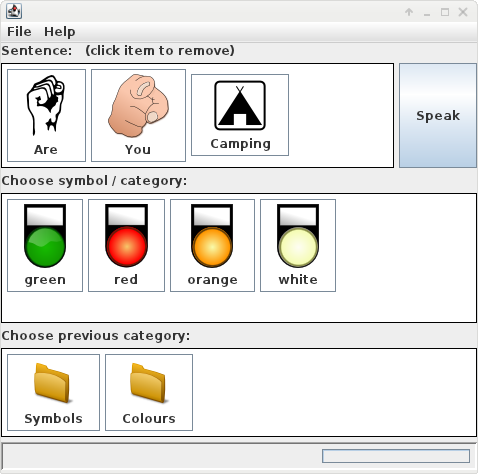 I've been working on a piece of open source software to assist people who have aphasia (speech difficulties), and it is now sufficiently functional to be worth mentioning. It's still very rough around the edges, but if you are on a debian based system you should be able to easily get it up and running and see what you think. If you are on other platforms you'll currently need a bit (alright, a lot) of java knowledge to get this up and running. If you have the time to help I'd be very grateful. You don't have to be a coder, just letting me know if it works for you would be great. If you want to know more or would like to give it a try then please do head over to the project page at http://launchpad.net/communication.